← Should Guns Be Allowed in Our Society? A Joint Committee on Judiciary introduced Tuesday, Connecticut Senate Bill 1094, an act banning large capacity ammunition magazines, which would prohibit gun enthusiasts from possessing firearms that accept magazines that hold more than ten rounds of ammunition. If passed and signed into law, any person in possession of any magazine greater than ten round capacity, who has not already surrendered the magazine prior to enactment or ninety days after enactment, will be guilty of a class D felony. In spite of the recent rhetoric coming out of the recent shooting incident in Arizona, there is no correlation between the arbitrary size of gun magazine and gun violence. No law of this kind would have altered the outcome of the horrible shooting in Phoenix. It takes less than a second to drop an empty magazine and insert a full one. SB 1094 is a law starting off looking to be overturned or deemed unconstitutional. This law also does not give exception to ownership prior to passage the law (grandfather clause) as does the California law but is an ex post facto law. So your ignorance of the law could land you in jail – you, the otherwise law abiding citizen who has owned guns for years with no intent of ever committing an atrocious act. Hundreds of thousands of law abiding citizens and gun enthusiasts will suddenly become criminals. Residents of Connecticut need to stand up, make noise and be heard to block this legislation. It has happened in California and Massachusetts and other states are thinking about it. The Los Angeles Police Chief and Mayor also recently announced their support for a Federal law that would limit the size of gun magazines. Our Second Amendment rights continue to be under attack. The Founding Fathers inserted the Second Amendment in the Bill of Rights not necessarily just to enable every American to defend themselves in their own home, but to defend themselves against tyranny of their own government. The 2nd Amendment follows the First Amendment (the Right to Free Speech) for a very striking reason: It backs up the right to speak your mind with power. 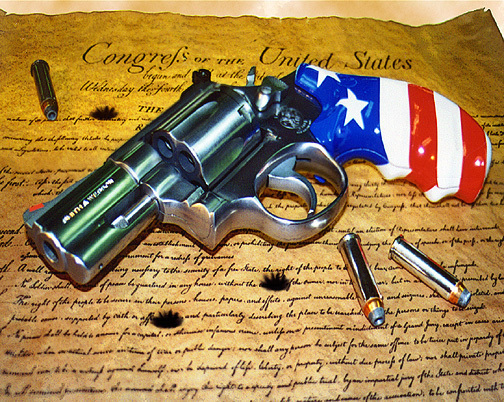 The 2nd Amendment is an insurance policy for every American against repressive government. The Founding Fathers were armed with virtually the same armaments the British soldiers had. And they used those arms to defend their most important weapon, the printing press. They are also looking for a similar Federal bill to limit the size of magazines. Does it surprise anyone that a repressive regime like we have now would endorse a ‘Common Sense’ approach to disarmament? ‘Common Sense’ for them is a lot different than ‘Common Sense’ for you and me. If they trusted you, they would encourage ‘Common Sense’ arms proliferation for responsible citizens, as an armed society is a polite society. Look how may states are adopting legal conceiled carry without a permit now – what they call ‘constitutional carry’. These Connecticut legislators are just some more silver-tounged elitists trying to talk you out of your freedoms. How anyone, much less an Attorney and Legislator could introduce such a bill is ridiculous! To seize lawfully purchased, taxed property is a direct violation of the 4th Ammendment, 5th Ammendment and Seventh Article here in CT. If this does in fact go through I have every intention of continuing forward with legal action. Further, how does a few “Chief’s of Police” support this legislation? Do they not understand the Constitution? If they don’t they “should have known”. So here we are in CT with our Democrat friends. Lets abolish the death penalty, legalize Marijuana, tax the small business man and outright propose to violate civil rights. We all hope it doesn’t pass. From what I hear, there may not be a lot of support for the bill. I am researching it right now and plan to have an update in a day or so. Stay tuned.